Revisiting the past What do you remember? 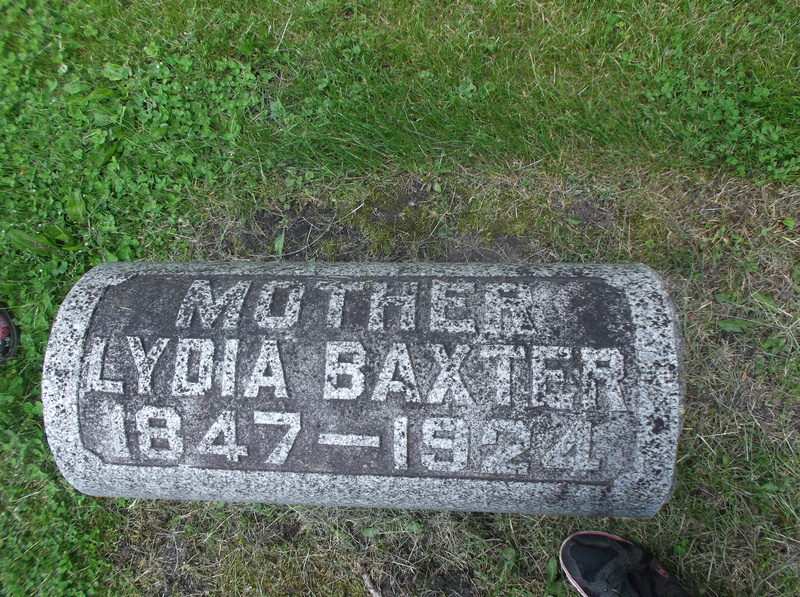 Mrs. John Baxter, seventy-eight years of age, died at 4:00 o'clock yesterday afternoon at her home, 1202 South Twenty-second Street, after a lingering illness. She had been ill during the past few weeks with the flu previous to which she had suffered from cancer. She is survived by her husband, two daughters and a son. They are Mrs. H.M. Webb, of Salem, Oregon; Mrs. O.W. Schoonmaker of Savage, Montana, and Walter Burrell of Fort Dodge. Twenty grandchildren and eight great-grandchildren also survive. 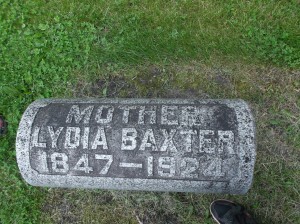 Mrs. Baxter was born in Pennsylvania and has been a resident of Fort Dodge for the past twenty-four years. The funeral will take place Thursday afternoon at 2:00 o'clock from the home and at 2:30 from the Epworth Methodist Church. The Rev. T.J. Pettit will have charge of the services. Burial will be made in Oakland cemetery. http://fortdodge.advantage-preservation.com/document/fort-dodge-messenger-and-chronicle-1924-05-14-page-14 Photo taken 23 May 2015 at Oakland Cemetery. I recently purchased copies of a birth certificate, a marriage license and a death certificate. 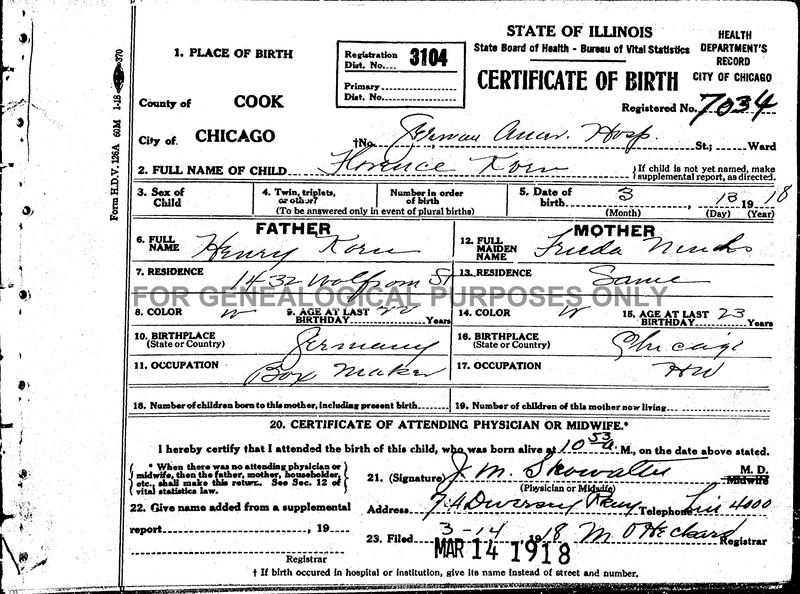 Birth certificate: Florence Korn This shows her parents' names. Her mother's maiden name (Frieda Muhs) was indexed as Frieda Ninho. I can tell how the indexer made the mistake (really sloppy handwriting), but it's still irritating. 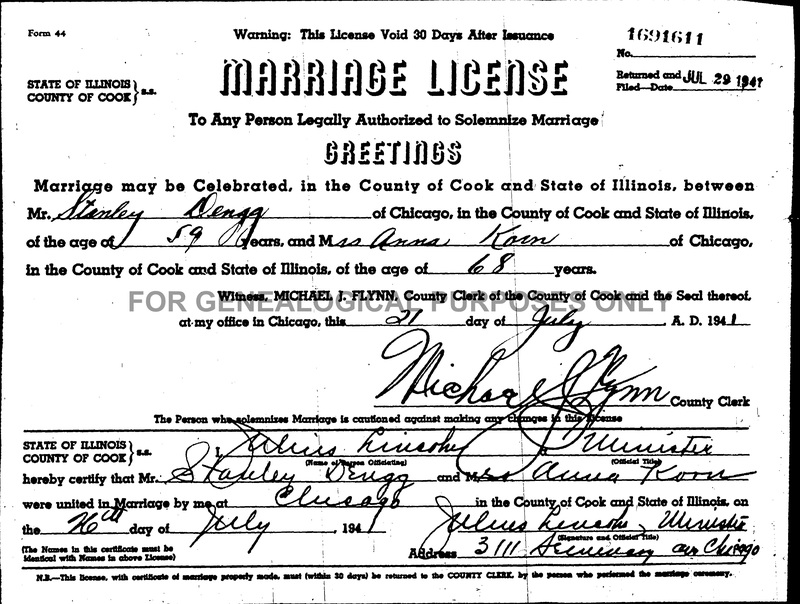 Marriage licence of Stanley Dengg to Anna Korn (widow of Jacob Korn) on 26 Jul 1941. 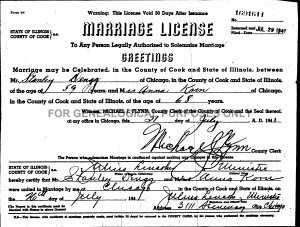 Marriage license: Stanley Dengg and Anna Korn This shows the date and place of marriage, as well as the correct name of the groom. For some reason, I thought it was Anton. I don't know where I got that from, but it does show that memories can be false (or vague ... ). This is the wedding that my mom attended when she was about 3. She said it was the first time she got drunk (I have no idea if there were many times, I only know about this one). She went around drinking beer out of the glasses that the adults left within reach. I'm sure they thought it was a hoot. 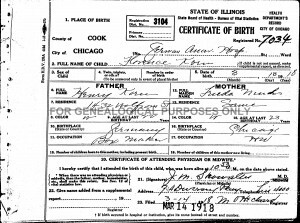 Death certificate: Anna Korn I was hoping to get her parents' names from this, but unfortunately, they are not listed. The informant was her daughter-in-law, Frieda (Muhs) Korn. So I'll have to find the information elsewhere. Two things: Henry Muhs in Illinois Death and Stillbirths, 1916-1947, died 8 Jan 1927 in Chicago, Cook, Illinois, United States. 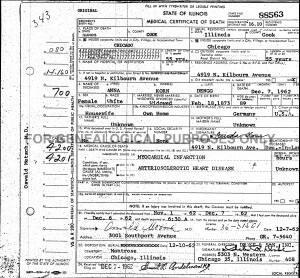 Lists father (Peter Muhs), mother (Kath ... Stotenberg) names and birth place (Bosbik by Kiel, Germany), wife Hannah Muhs, occupation: painter, race: white, address 1432 Wolfram. FHL film number is 1877900 (anybody want to go look that up for me?). 1920 Census lists Henry and Hannah Muhs living at 1432 Wolfram in Chicago. He owned the building. Henry, Frieda and Florence Korn also lived in the building. Frieda is the daughter of Henry and Hannah Muhs. 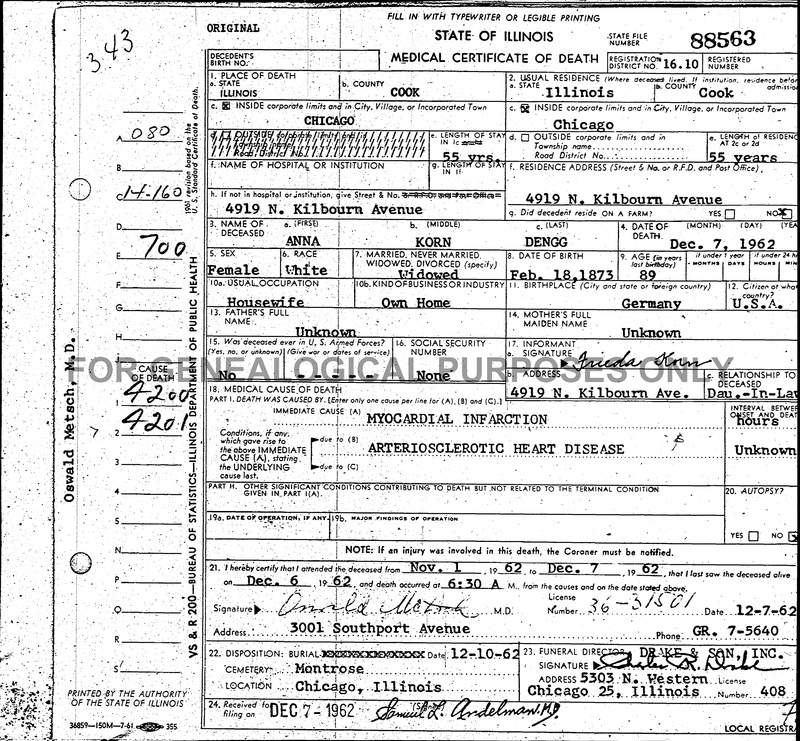 New information: Henry Muhs death date, father's and mother's names, birth place for all three, Henry's occupation, 1920 place of residence, Henry Muhs owned the building and his daughter, son-in-law and granddaughter lived there. Henry Korn was a box maker. Henry Korn came to the U.S. in 1907. Henry and Hannah Korn came to the U.S. in 1887. Google image of 1432 Wolfram: Next step is to get all this information linked to my three trees on Ancestry, FamilySearch and WikiTree. Note: Johanna Cornilsen married Heinrich Muhs. She apparently went by Hannah. I believe that she remarried after he died. The name of her second husband might be Anton Dengg, but I haven't corroborated that. My mom (Janice Burrell Snyder) told that she got drunk when she was about 3 at her grandma's wedding when guests left a little beer in the bottom of their glasses and little Janice went around finishing off the glasses. On my way to the library in Fort Dodge to volunteer at the Webster County Genealogical Society, I had this thought: everybody has heroes and villains in their family. It's so simple and true. Some people try to hide the skeletons in the family closet, but I think we really shouldn't do that. Maybe I would feel differently if it turned out that a close relative was high in the Nazi party or something along those lines, but I think we have to accept our family history. In my family's case, one known villain was a young man who in a heated moment made a really bad decision. On Saturday, July 11, 1908, Will Carr was involved in a fight with a stranger near the train depot in Gowrie, Iowa, after drinking heavily that afternoon. Town Marshal Thomas Nicholson apparently broke up the fight or attempted to arrest Will Carr. Will (he's sometimes referred to as William or Wilbur) went home and got a gun, then went back to the depot, where he found the marshal and shot him. There are newspaper accounts of the incident and the subsequent trial. One of the articles mentions that Thomas Nicholson's wife was the sister of Ira Carr's wife. This Ira Carr was the brother of Will Carr. This was confirmed in a book called "The Biographical Record of Webster County, Iowa" which was published by the S.J. Clarke Publishing Company in 1902. That book lists the children of Richard Quick, including Bessie, married to Thomas Nicholson, a farmer of Roland township, and Leona, married to Ira Carr, also a farmer of Roland township. Roland township is north of Gowrie. I'm sure that time eases the impact of these events. Had this occurred within my lifetime I would probably not be so easy with it. But we are the sum of everything that has happened before us. It shapes our families and it shapes our selves. We can embrace the good and try to learn from the bad, but it doesn't help to hide it away. 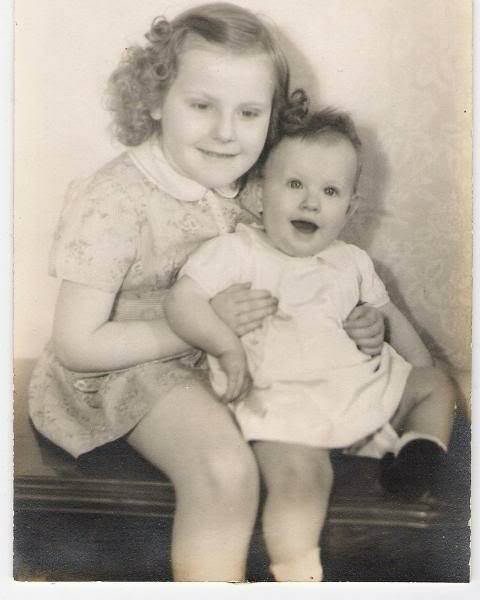 This is a photo of my mom (Janice) with her younger sister Diane. The youngest sister, Nancy, had not been born yet. I'm guessing Diane was about 1-2 years old here, so Mom would be about 6-7 years old. So, about 1944-1945. I just like this photo. It looks like it was taken at home. Mom's hair is cute and curly. I can really recognize her, even though she is so young in the photo. What I should do now is show the old family photos to Mom - to see if they awaken any memories, and see what she can communicate about them. It's difficult now because of her dementia and speaking in rhyme, but we try to glean the meanings of what she's trying to tell us. I decided to participate in the Genea Bloggers advent calendar of Christmas memories on this blog. The first blog prompt is The Christmas Tree. Growing up, my family had live trees. Dad made the tree stand himself - it was very sturdy, but it was not very pretty. We had a lot of glass ornaments and a mixture of other kinds. My favorite ornaments were musical instruments. We had glass ones like violin or cello - it can be hard to tell with instruments, especially when you haven't seen the real thing in person (and it was decades ago, so my memory is faint). There were also drums that had little drumsticks. I think they were styrofoam covered in paper and fabric or felt. There were also shiny and dull glass ornaments with glitter designs. And at least one bread dough ornament in the shape of a dove. I'm sure there were home-made (or school-made) creations by Donna and me, as well. We also had two or three tinsel garlands and a garland made of plastic candy. The bulbs were the big, fat kind. I think we had a glass tree topper, not an angel. 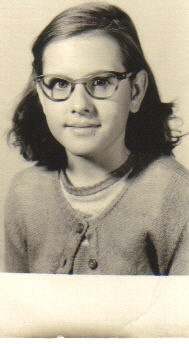 As I mentioned, it was decades ago. I don't have any photos, and it's hard to remember after all this time. But that's the idea behind this blog. The mission of this blog is to share family history and memories. Many of my ancestors lived in Fort Dodge, Iowa - there has been an ancestor or relative of mine living in Webster County since 1880, when William and Lydia Burrell brought their family here from Wisconsin. It's possible that some of Lydia's family had been here prior to that - it's one of the mysteries to be discovered. So when I found out about WikiTree, I quickly got an invitation and joined. You can't just sign up - you have to be invited. At this point, I need to add my photo (if you see the photo that means I've added it since). And I've got more names to add. One thing you should do if you join (and you can ask me for an invitation by email at carol@inoldfortdodge.com ) is read carefully and sign (electronically) the Wiki Genealogist Honor Code. It has nine requirements, and you should understand and agree with them before you add to the wiki. The cool thing (well, one of many cool things) is that eventually one of the people you add will be the same as somebody else's person. That means you get access to names of people that perhaps you didn't know about before. And to a genealogist or family history researcher, that is so exciting. I went into this with the plan to create more detailed profiles than simply names, dates and places. So I'm including pictures where I have them, and anecdotes about the people whenever possible. It truly is a great time to be a genealogist.